Rory Hendrix is the least likely of Girl Scouts. She hasn’t got a troop or even a badge to call her own. But she’s checked the Handbook out from the elementary school library so many times that her name fills all the lines on the card, and she pores over its surreal advice (Uniforms, disposing of outgrown; The Right Use of Your Body; Finding Your Way When Lost) for tips to get off the Calle: that is, the Calle de las Flores, the Reno trailer park where she lives with her mother, Jo, the sweet-faced, hard-luck bartender at the Truck Stop. Rory’s been told that she is one of the “third-generation bastards surely on the road to whoredom.” But she’s determined to prove the county and her own family wrong. Brash, sassy, vulnerable, wise, and terrified, she struggles with her mother’s habit of trusting the wrong men, and the mixed blessing of being too smart for her own good. From diary entries, social workers’ reports, half-recalled memories, arrest records, family lore, Supreme Court opinions, and her grandmother’s letters, Rory crafts a devastating collage that shows us her world even as she searches for the way out of it. Hassman’s debut is both beautiful and tragic. Rory is an extremely endearing character, she is both old and young for her age, which is not terribly surprising, given everything she’s been through. GirlChild doesn’t have a traditional structure, Rory doesn’t tell her story in a strictly linear fashion, and it is often interspersed with the lessons she has learned from the Girl Scout Handbook. This structure works very well for the story, however, Hassman weaves the strands together beautifully, and these diversions may actually keep Rory’s life from seeming too brutally horrid, as they might if she told parts of it straight through. Honestly, I wasn’t completely sure about Hassman’s narration initially. Her voice is reminiscent of Sarah Vowell’s, not exactly a typical narrator. There were three things that worked in Hassman’s favor, however. First, her voice and delivery fit her character very well, naive and too grown-up at the same time. Second, Hassman is highly connected with the characters and story she created and narrates with feeling and empathy. Third, although her voice is not that of a typical narrator, Hassman gives an incredibly professional performance, only the relative squeakiness of her voice tells the listener that she is likely not a professional narrator. 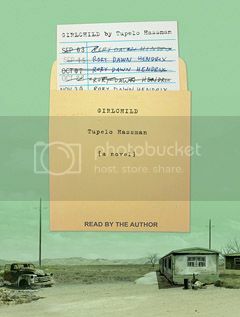 Overall Hassman makes a great narrator for GirlChild. There are many points when GirlChild verges on devastating, but it is always worthwhile, whether in print or audio.